The Mexican novelist, Agustin Jose, once wrote, 'The best use of life is love. The best expression of love is time. The best time to love is now'. And do you know what? It almost sounds like he's speaking about this very film. This one Directed by: Alejandro Agresti; and Starring: Keanu Reeves, Sandra Bullock, and Christopher Plummer. It was made in 2006, and lasts for about 105-minutes. OK. So let me try to put this strange situation into some sort of perspective. 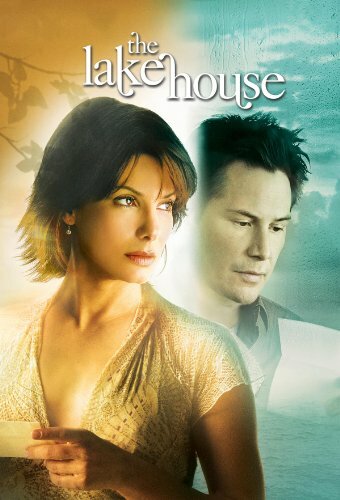 For some unexplained reason, the architect, Alex Wyler (Keanu Reeves), somehow manages to send a letter to the pretty young Doctor who once lived in his old house, Kate Forster (Sandra Bullock), although she's currently two years in the future. Furthermore, as days turn into weeks, these two time-crossed pen-pals both get to know each other on a very personal level, where they talk about love, life, happiness, and all of that jazz. Alright. I know what you're thinking to yourself, folks! And I agree with you. Honestly I do. This does sound very-very bizarre indeed! However, is it as bizarre as when Kate instructs Alex to retrieve a book she lost in the past? Or is it as bizarre as when Alex cannot seem to phone Kate in the future? No. Don't fret. There respective paths aren't barred by their respective partners: Morgan and Mona (Dylan Walsh and Lynn Collins). Plus Alex's ill Dad, Simon (Christopher Plummer), doesn't hinder these proceedings either. Yet, whilst saying that, that's most probably why what next transpires slowly slides into play when Kate remembers kissing Alex at a birthday party she had two years previously. As a tragedy has a cyst - a prearranged dinner is fatefully missed - the passing years don't get any better - and ultimately a date with destiny is saved by a posting of a letter. Damn you 'The Lake House'! You've tricked me. You've tricked me into liking you even though I don't know why. Well, I suppose it could be because I like the actors involved and the overall romantic premise? Moreover, it could also be because I enjoy following strange f*cking stories which don't fully explain themselves in hindsight? Yeah. Most probably. Plus I have to state that this tale was very engaging on a personal level. As in its own amiable way, it was able to amalgamated love and spirituality in two uneven doses, resulting in a film that touched a nerve within me which I don't really like being touched. You see, if I'm going to be Frank about it, folks, one of the main reasons why I don't really care for romantic movies, is because they can appear somewhat formulaic on occasion, and blind the audience into believing something that isn't very natural or very real. Granted, in the case of this flick, it did sidestep the 'formula' part of the equation with some great acting by Keanu and Sandra. And as for the 'natural' part of the equation, it took another even bigger sidestep by laving the screen with sentimentality and the unknown. Hey! Don't get me wrong. I don't think this movie is some sort of timeless classic (excuse the obvious put). Occasionally there were places in this drama where it seemed to lag -- especially in the first twenty minutes or so, because it was kind of irritating to piece together what was really going on. Also, I have to say that I wasn't too keen on how certain scenes came across somewhat hooey in execution -- like those long forlorn and brooding segments for instance. Well. Come on. Let's face it. If you could talk to someone who lived two year in the future, wouldn't you ask them for the lottery number of something? Instead of just being coy and trying to play nicely-nicely? Anyway, that's my cynical side speaking. So before I write something just as sardonic, here, check out these filmic-facts. (1) 'Warner Brothers' first released this $40 million dollar production on the 16th of June, 2006, clawing back $114 million dollars at the box office. (2) This film is a remake of a Korean film made in 2000 called 'Il Mare'. It starred Jun Ji-hyun and Lee Jung-jae. (3) During pre-production this project was given the working title of 'The Sea'. (4) For reasons of his own, John Cusak turned down the role of Alex Wyler in this drama. (5) The actual 'Lake House' was specifically built for this movie and then dismantled afterwards. According to Sandra Bullock, it did not have a toilette. (6) Apart from some of the 'mail box' scenes -- shot at Paramount Ranch, California -- the rest of this film was shot within the American state of Illinois. This includes Aurora, Chicago, Broadway Avenue, Maple Lake, Navy Pier, Oak Park, Riverside, Willow Springs, and the Richard J Daley Memorial Plaza. (7) This was Keanu Reaves's first 'time travel film' after he starred in the 'Bill and Ted' series of movies. (8) Sandra Bullock named the dog in this picture 'Jack' as a 'homage' to Keanu's character from the action-adventure, 'Speed'. Well, as you may know, this was the first film these two b*tches starred in together. Ha! (9) I kid you not; this was the first movie ever to be released simultaneously on DVD, HDDVD, and Blu-ray Disc. Overall 'The Lake House' is a fairly decent film. The actors were great. The premise was intriguing. The overall romantic ambience was spot on. Yet from my own cynical point of view, I would have liked it a lot more if it was a bit more natural and down to Earth.